Last night I had the pleasure of attending the opening performance of the new season of the RTÉ National Symphony Orchestra at the National Concert Hall in Dublin. As well as being the first concert of the season, it was also my first ever visit to the National Concert Hall. To mark the occasion we were in the presence of the Uachtarán na hÉireann, Michael D Higgins, and his wife Sabena. By `occasion’ I of course mean the first concert of the season, rather than my first visit to the NCH. After the concert the audience were all treated to a glass of Prosecco on the house too! 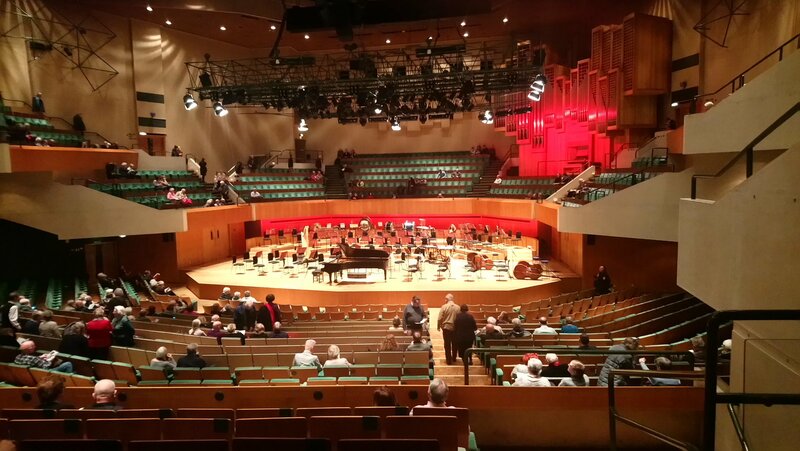 I’ve done quite a few reviews from St David’s Hall in Cardiff over the years, so before writing about the music I thought I’d compare the venues a little. The National Concert Hall was built in 1865 and soon after its construction it was converted into the main building of University College Dublin. It was converted to a concert venue when UCD moved out of the city centre, and fully re-opened in 1981. It is a bit smaller than St David’s – capacity 1200, compared with 2000 – and does not have such a fine acoustic, but it is a very nice venue with a distinctive and decidedly more intimate vibe all of its own. I had a seat in the centre stalls, which cost me €40, which is about the same as one would expect to pay in Cardiff. The NCH is situated close to St Stephen’s Green, which is a 15 minute walk from Pearse Station or a 30 minute walk from Connolly (both of which are served by trains from Maynooth). The weather was pleasant yesterday evening so I walked rather than taking the bus or Luas from Connolly. I passed a number of inviting hostelries on the way but resisted the temptation to stop for a pint in favour of a glass of wine in the NCH bar before the performance. Anyway, last night’s curtain-raiser involved just one piece – but what a piece! – Symphony No.2 (“Resurrection”) by Gustav Mahler. This is a colossal work, in five movements, that lasts about 90 minutes. The performance involved not only a huge orchestra, numbering about a hundred musicians, but also two solo vocalists and a sizeable choir (although the choir does not make its entrance until the start of the long final movement, about an hour into the piece). The choir in this case was the RTÉ Philharmonic Choir. At various points trumpets and/or French horns moved offstage into the wings and, for the finale, into the gallery beside the choir. About two years ago I blogged about the first performance I had ever heard of the same work. Hearing it again in a different environment in no way diminished its impact. Stunning though the finale undoubtedly was, I was gripped all the way through, from the relatively sombre but subtly expressive opening movement, through the joyously dancing second that recalls happier times, the third which is based on a Jewish folk tune and which ends in a shattering climax Mahler described as “a shriek of despair”, and the fourth which is built around a setting of one of the songs from Des Knaben Wunderhorn, sung beautifully by Jennifer Johnson (standing in wonderfully for Patricia Bardon, who was unfortunately indisposed). Jennifer Johnson has a lovely velvety voice very well suited to this piece, which seems more like a contralto part than a mezzo. The changing moods of the work are underlined by a tonality that shifts from minor to major and back again. All that was very well performed, but as I suspect is always the case in performances of this work, it was the climactic final movement – which lasts almost half an hour and is based on setting of a poem mostly written by Mahler himself, sung by Orla Boylan – that packs the strongest emotional punch. The massed ranks of the RTÉ Philharmonic Choir (all 160 of them) weren’t called upon until this final movement, but as soon as they started to sing they made an immediate impact. As the symphony moved inexorably towards its climax the hairs on the back of my neck stood up in anticipation of a thrilling sound to come. I wasn’t disappointed. The final stages of this piece are sublime, jubilant, shattering, transcendent but, above all, magnificently, exquisitely loud! The Choir, responding in appropriate fashion to Mahler’s instruction to sing mit höchster Kraft, combined with the full force of the Orchestra and the fine concert organ of the NCH to create an overwhelming wall of radiant sound. The increasing tension, working up to the final climax, is so tremendous that I don’t know myself, now that it is over, how I ever came to write it. Well, who knows where genius comes from, but Mahler was undoubtedly a genius. People often stay that his compositions are miserable, angst-ridden and depressing. I don’t find that at all. It’s true that this, as well as Mahler’s other great works, takes you on an emotional journey that is at times a difficult one. There are passages that are filled with apprehension or even dread. But without darkness there is no light. The ending of the Resurrection Symphony is all the more triumphant because of what has come before. The end of the performance was greeted with rapturous applause (and a well-deserved standing ovation). Congratulations to conductor Robert Trevino, the soloists, choir and all the musicians for a memorable concert. On my way out after the Prosecco I picked up the brochure for the forthcoming season by the RTÉ National Symphony Orchestra, which runs until next May. I won’t be attend all the Friday-night concerts, but I will try to make as many as I can of the ones that don’t involve harpsichords. Well, I’m back in Maynooth after a weekend in Cardiff, on the Sunday of which I went to St David’s Hall to see the Cardiff Philharmonic Orchestra playing Gustav Mahler’s Third Symphony. Actually this concert was originally scheduled to take place on the evening of Friday 15th June, which is why I booked a ticket to return from Bonn in time to see it instead of waiting for the formal close of the meeting. As it turns out, my flight was so late I would have missed it but fortunately the Rolling Stones intervened. Because Jagger et al were performing at the Principality Stadium in Cardiff on Friday (with all the consequent congestion and traffic disruption that implies) it was decided to shift the concert to Sunday 18th, but I couldn’t be bothered to change my flight. Anyway, it proved an excellent way to spend a Sunday afternoon. Gustav Mahler spoke of his Third Symphony as being “of such magnitude that it mirrors the whole world” and you can see what he was getting at by just looking at the scale of the forces arrayed on stage when it’s about to be performed live. For yesterday’s concert at St David’s Hall, the Cardiff Philharmonic Orchestra was augmented by the WNO Community Chorus and the Choristers of St David’s Metropolitan Cathedral Choir, as well as soloist mezzo soprano Kate Woolveridge. The orchestra needed to perform this extravagant work is much larger than for a normal symphony, and it involves some unusual instrumentation: e.g. two harps, a contrabassoon, heaps of percussion (including tuned bells and double tympanists), etc. The string section was boosted by double-basses galore, and there’s also a part (for what I think was a flugelhorn) to be played offstage. The work is also extremely long, being spread over six movements of which the first is the longest (over 30 minutes). Yesterday the performance stretched to about 1 hour and 40 minutes overall, with no interval. I don’t know of any symphonic works longer than this, actually. It’s worth pointing out that the orchestra and choir(s) tackling this immense work were non-professional. 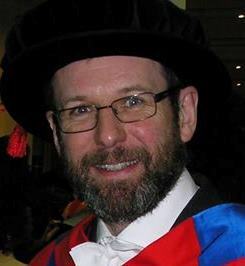 It’s also worth pointing out that the principal French Horn – who is given a lot to do in this piece – was none other than Dr Bernard Richardson, recently retired from the School of Physics & Astronomy at Cardiff University. I have to admit I have always had lot of trouble getting to grips with the first movement, in which various themes are repeatedly played off against each other, punctuated by a series of extravagant crescendo passages in which the orchestra threatened to blow the roof off. It is, at times, thrilling but also manic and, to me, rather indecipherable. The second movement, in the form of a minuet, is elegant enough, and was beautifully played (especially by the strings), but in comparison with the wayward exuberance of the first movement it sounds rather conventional. The third movement, however, is totally gorgeous, especially in the passages featuring the offstage flugelhorn (?) and the string section of the orchestra on stage. From this point this piece started to bring me under its spell. The solo vocalist and choir(s) were marvellous in the fourth and fifth movements, the former a setting of a poem by Nietzsche and the latter a mixture of traditional verse and Mahler’s own words, but it was in the majestic sixth and final movement that the orchestra really reached its peak. This is one of the most romantic movements to be found in all of Mahler, passionate, lyrical and supremely uplifting. At times before the sixth movement the orchestra (especially the brass) had struggled a bit with the demands of the score, but the finale was as good a performance as you’ll hear anywhere. Mahler’s 3rd Symphony is an epic journey through a landscape filled with dramatic contrasts. At times you wonder where you are going, and sometimes feel in danger of getting completely lost, but by the time you arrive triumphantly at the final destination all those doubts had melted away. Congratulations to the Cardiff Philharmonic on a very fine performance, warmly received by the audience. After the concert there was a collection on behalf of the Forget-Me-Not Chorus, which supports people with dementia and their families through weekly singing sessions. I think this is a great initiative and made a donation on the way out – if you feel like doing likewise you can do so here. Well, that’s my concert-going at St David’s Hall over for another season. Indeed, it’s probably the last concert I’ll be attending there for the foreseeable future, as I’ll be relocating fully to Ireland this summer. I’ll have many fine memories of listening to music there. I spent yesterday afternoon at a very enjoyable concert at St David’s Hall in Cardiff for a programme of music by Beethoven and Mahler given by the Philharmonia Orchestra under Principal Guest Conductor Jakub Hrůša. The picture above was taken about 10 minutes before the concert started, from my seat in Tier 1. Quite a few people arrived between then and the beginning of the performance, but there wasn’t a very big audience. St David’s Hall may have been less than half full but those who did come were treated to some fantastic playing. The first half of the concert consisted of Beethoven’s Piano Concerto No. 1 (in C) with soloist Piotr Anderszewski. This work was actually composed after his Piano Concerto No. 2 but was published first. It consists of three movements, an expansive slow movement (marked Largo) sandwiched between two sprightly up-tempo movements, marked Allegro con brio and Rondo-Allegro Scherzando, respectively. I think the first part of the last movement, full of energy and wit, is the best part of this work and Anderszewski play it with genuine sparkle. His performance was very well received, and he rounded it off with a charming encore in the form of a piece for solo piano by Bartok. After the wine break we returned to find the piano gone, and the orchestra greatly expanded for a performance of Mahler’s Symphony No. 5 , the fourth movement of which (the `Adagietto’) is probably Mahler’s best-known music (made famous by its use in Visconti’s 1971 film Death in Venice). This lovely movement is sometimes performed on its own – a practice Mahler himself encouraged – but I think it’s particularly powerful when heard in its proper context, embedded in a large orchestral work that lasts well over an hour. Although nominally five movements, this work is really in three sections: the first section consists of the first two movements (the first starting with Trauermarsch (a funeral march), and the second a stormy and at times savage movement, punctuated with brief interludes of peace). The last section consists of the beautiful Adagietto 4th movement (played entirely on the strings) followed by an energetic and ultimately triumphant finale. In between there’s an extended Scherzo, which is (unusually for Mahler) rather light and cheerful. Roughly speaking this symphony follows a trajectory from darkness into light and, although it certainly doesn’t go in a straight line, and does start with a death march, this is undoubtedly one of Mahler’s cheerier works! The Philharmonia Orchestra gave a very accomplished and passionate reading of this piece, with especially fine playing from the brass section (who have lot to do). The exuberant ending brought many members of the audience to their feet and rightly so, as it was a very fine performance – the best I’ve heard live of this work. Last night I went with a group of friends and colleagues to St David’s Hall in Cardiff for concert that I had been looking forward to for some time, featuring the Orchestra of Welsh National Opera under the baton of WNO’s Music Director Tomáš Hanus in a programme of music by Mahler and Shostakovich. It turned out to be no disappointment! Before the interval the Orchestra was joined by young mezzo-soprano Tara Erraught for the song-cycle Lieder eines fahrenden Gesellen by Gustav Mahler, featuring settings of four poems written by the composer (though clearly influenced by other sources). The four pieces are of contrasting mood, with the second being the most upbeat and the third the most despairing (as well as the most operatic in style) and they were written in response to an unrequited passion. I thought Tara Erraught sang very beautifully indeed, bring out the emotional depths of this piece. Unusually for Mahler, the orchestra for this work was not excessively large, and a good balance with the solo voice was achieved that allowed the subtleties of both vocal and orchestral parts to be enjoyed to full effect. After the interval the stage was much fuller as the orchestral forces required for the second work were much larger. Symphony No. 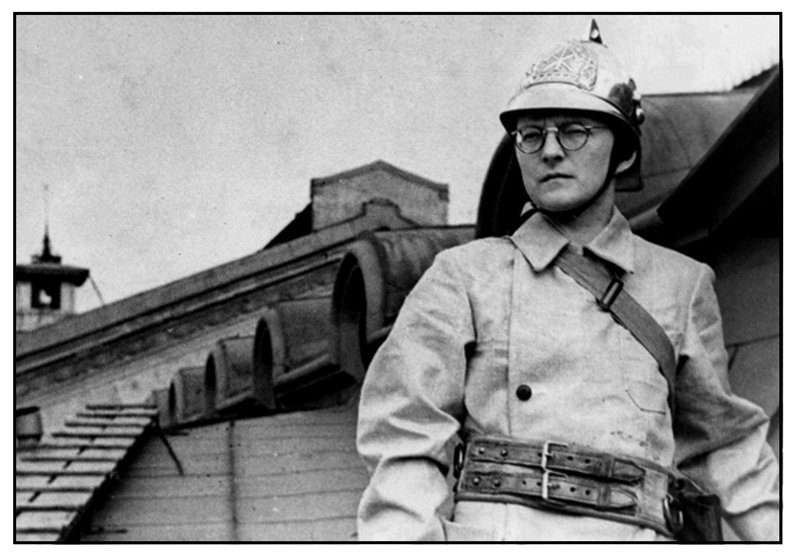 7 by Dmitri Shostakovich (“Leningrad”) is a piece that evokes particular memories for me as I first heard it about thirty years ago on the radio while sitting in a car that was driving through a torrential downpour in the middle of the night from Kansas City to Lawrence. The repeating theme and snare drum figures in the 1st Movement that represent the remorseless advance of the invading army had even more powerful affect when accompanied by the incessant driving rain. I’ve heard this piece on recordings and live broadcasts on many occasions since then, but have never heard it performed live until last night. What can I say about this work? Well, not much that hasn’t been said before. It was dedicated to the city of Leningrad where the composer lived, until he was evacuated during the siege, and where he wrote most of the 7th Symphony. He served as a volunteer fireman in Leningrad during the early part of the Second World War (see above), having been turned down for military service owing to his poor eyesight. Leningrad was besieged by German forces for almost 900 days, from September 1941 until January 1944, and it’s impossible not to see the work in this historical context. Though the four movements have themes – `War’, `Memories’, `My Native Field’ and `Victory’ – this is not really a programmatic piece. It does, however, succeed in invoking the terror and brutality of armed conflict in a manner that is so compelling that it’s almost overpowering. Many symphonies have as a theme some kind of struggle between light and dark, or between good and evil, but it always seemed to me that this work is not so much like that as it is a representation of a struggle simply for survival against annihilation. Even the end of the intense fourth movement, when the music finally resolves into the key of C Major, suggesting a kind of `victory’, echoes of the previous conflict persist, suggesting (to me) that this particular battle does not intend in any kind of triumph but in a sense of grim endurance that is more resignation than resolution. Musicologists tend not to like this Symphony and its reputation dwindled in the West in the post-War period. Maybe it is true that it has defects when thought of as an exercise in composition, but fortunately I am not a professional critic so I am quite content to say that for me, personally, this work has an emotional impact like few others and it is one of my favourites in the whole symphonic repertoire. Last night the Orchestra of Welsh National Opera delivered an impassioned performance that confirmed everything I felt about this work but with the added dimensions that you can only get from a live performance. From the immaculately controlled crescendo representing the advancing invaders that erupts into a nightmarish depiction of the ensuing battle right through to the last movement with its ending in resolution tempered in bitterness and regret, this performance had me gripped. The Orchestra of Welsh National Opera played as if their lives depended on it, and the climactic moments were authentically terrifying and, it goes without saying, wonderfully loud. Many congratulations to Tomáš Hanus for inspiring his musicians to such heights. He looked absolutely drained at the end, as he acknowledged the applause of a very appreciative audience in St David’s Hall. It’s a shame that there were so many empty seats. That often seems to be the case when the music is relatively `modern’. The Cardiff audience does seem to have rather conservative tastes in that way. On the way out of the Hall after the performance all the comments I heard – and those afterwards on Twitter – were overwhelmingly enthusiastic. I feel privileged to have been among those present at this thrilling event. UPDATE: I didn’t realise it was being broadcast live on BBC Radio 3 and is now available on iPlayer here for you to share the experience! “Darkness, turbulence and an unmistakable undertone of violence” – what could be a more fitting way to spend a Friday evening in January 2017 than listening to the epic Sixth Symphony by Gustav Mahler. So apt is this work for the times we’re living through that it was performed on Thursday evening by the London Symphony Orchestra conducted by Sir Simon Rattle and broadcast live on BBC Radio 3; you can catch that performance on the BBC iPlayer here. I’ve always preferred my music live rather than recorded, so I went to St David’s Hall on Friday to hear it performed by the BBC National Orchestra of Wales under the direction of Thomas Søndergård. This was recorded live, and will be broadcast by BBC Radio 3 on Friday 27th January, and available thereafter on iPlayer so you can compare the two versions if you want to. Before the main course, we heard the excellent BBC National Chorus of Wales singing four motets by another late Romantic composer, Anton Bruckner. The pieces chosen were all settings of latin religous texts: Locus Iste, Os Justi, Christus Factus Est, and Ave Maria. These are beautiful works, and interesting because of the many references they include to earlier musical forms, especially in the Os Justi which is in the Lydian mode, harking back to what at the time it was written (1879) was an obsolete church scale. These four works last only about 15 minutes in total. That explains why the bar staff weren’t taking interval orders before the concert started – there simply wouldn’t have been enough time to put the drinks out before the first half finished. Fortunately, my seat was near the door of the auditorium so I was able to make a quick escape and get my usual glass of wine at the bar before most of the audience. And then the Mahler. What can I say? It’s another huge symphony, in four movements lasting about eighty minutes, requiring a huge orchestra including tubas, bass trombones, harps and varied percussion including cowbells, a celesta, and of course the famous hammer.. I mentioned earlier on that I much prefer live concerts. One of the things that I remember vividly from last Friday was the sight of the huge wooden mallet that is used to deliver the “hammer blows of fate” in the final movement, which loomed ominously on stage in front of the percussion section throughout the performance. When it was finally deployed it came down with such force that it buckled the wooden box underneath, but even when it wasn’t being used it had a powerful stage presence. That’s one kind of experience you’ll never get from a recording. The first movement of this Symphony (Allegro energico) is a battle between a strident march theme and a passionate romantic melody, though the conflict is interrupted by a lengthy passage of remarkable peace and tranquility. In Mahler’s original version of this work, the Scherzo movement (in which the two main themes return in an even more agitated struggle) came second, but on reflection he swapped it with the Andante, which is measured and reflective but still with an undertone of foreboding. I’m not sure if anyone ever performs the original ordering anymore, but out of curiosity I’d like to hear it performed that way. The tonality and thematic content of the Scherzo mean it is more closely related to the Allegro than the Andante, which has led some to argue that, despite what Mahler thought, it should be played second. I don’t think that follows necessarily, but it would be interesting to hear how it works. The final movement is vast, intense, emotionally draining and absolutely wonderful. The mood changes continually from terror to euphoria, from triumph to tragedy and from optimism to despair. Many people I know dismiss Mahler’s music as “angst-ridden”. I don’t think you can describe all his compositions like that, but it’s fair to say that this symphony is bleak and ultimately nihilistic in its despair. The hammer blows of fate (three in the original composition, with one later removed by Mahler) signal the end of hope, but the end is a whimper rather than a bang. The music subsides into nothingness, its light fading into the “Dark Night of the Soul”. It’s no surpise that this is often called the “Tragic Symphony”, but however bleak the message may seem, it’s always uplifting to experience the “artistic conquest of the terrible”. If civilization is to survive in a world filled with suffering and arbitrary cruelty, then we have to come to terms with reality, not shy away from it. Mahler is one composer who isn’t afraid to tell it the way it is. The BBC National Orchestra of Wales was on top form for this concert – with outstanding work by the brass section in particular – and were marshalled with great vision and a mastery of detail by Thomas Søndergård. I’m sure I’ll remember this performance for a very long time. Last night I was at St David’s Hall in Cardiff yet again, this time for a piece that I’ve never heard in a live performance: Symphony No.2 (“Resurrection”) by Gustav Mahler. This is a colossal work, in five movements, that lasts about 90 minutes. The performance involved not only a huge orchestra, numbering about a hundred musicians, but also two solo vocalists and a sizeable choir (although the choir does not make its entrance until the start of the long final movement, about an hour into the piece). In my seat before the concert I was particularly struck by the size of the brass section of the orchestra, but it turned out to be even larger than it looked as there were three trumpets and three French horns hidden offstage in the wings for most of the performance – they joined the rest of the orchestra onstage for the finale. The musicians involved last night were the Orchestra and Chorus of Welsh National Opera, and the Welsh National Opera Community Choir, conducted by Tomáš Hanus who is the new music director of Welsh National Opera; this was his St David’s Hall debut. Soloists were soprano Rebecca Evans (who was born in Pontrhydyfen, near Neath, and is a local favourite at St David’s Hall) and mezzosoprano Karen Cargill (making her St David’s debut). I don’t really have the words to describe what a stunning musical experience this was. I was gripped all the way through, from the relatively sombre but subtly expressive opening movement through the joyously dancing second movement that recalls happier times, the third which is based on a Jewish folk tune and which ends in a shattering climax Mahler described as “a shriek of despair”, the fourth movement is built around a setting of one of the songs from Das Knaben Wunderhorn, sung beautifully by Karen Cargill who has a lovely velvety voice very well suited to this piece, which seems more like a contralto part than a mezzo. The changing moods of the work are underlined by a tonality that shifts from minor to major and back again. All that was wonderfully performed, but it was in the climactic final movement – which lasts almost half an hour and is based on setting of a poem mostly written by Mahler himself, sung by Rebecca Evans, that what was already a very good concert turned into something truly remarkable. On many occasions I’ve written about Welsh National Opera performances in the opera theatre and in the course of doing so I’ve very often mentioned the superb WNO Chorus. They weren’t called upon until the final movement, but as soon as they started to sing they lifted the concert to another level. At first they sang sitting down, which struck me as a little strange, but later on I realised that they were holding something in reserve for the final moments of the work. As the symphony moved inexorably towards its climax I noticed the offstage brass players coming onto the stage, the choir standing up, and the organist (who had been sitting patiently with nothing to for most of the performance) took his seat. The hairs on the back of my neck stood up in anticipation of a thrilling sound to come. I wasn’t disappointed. The final stages of this piece are sublime, jubilant, shattering, transcendent but, above all, magnificently, exquisitely loud! The WNO Chorus, responding in appropriate fashion to Mahler’s instruction to sing “”mit höchster Kraft” combined with the full force of the Orchestra and the St David’s Hall organ to create an overwhelming wall of radiant sound. Superb. Mahler himself wrote of the final movement: “The increasing tension, working up to the final climax, is so tremendous that I don’t know myself, now that it is over, how I ever came to write it.” Well, who knows where genius comes from, but Mahler was undoubtedly a genius. People often stay that his compositions are miserable, angst-ridden and depressing. I don’t find that at all. It’s true that this, as well as Mahler’s other great works, takes you on an emotional journey that is at times a difficult one. There are passages that are filled with apprehension or even dread. But without darkness there is no light. The ending of the Resurrection Symphony is all the more triumphant because of what has come before. The end of the performance was greeted with rapturous applause (and a well-deserved standing ovation). Congratulations to Tomáš Hanus, Karen Cargill, Rebecca Evans and all the musicians who took part in last night’s concert which is one that I’ll remember for a very long time. P.S. You might be interested to know that St David’s Hall has been ranked in the world’s Top Ten Concert Halls in terms of sound quality. Those of us lucky enough to live in or near Cardiff are blessed to have such a great venue and so many superb great concerts right on our doorstep! P.P.S. The concert got a five-star review in the Guardian. Three things led me to post this recording. One is that this piece (though not this performance) was one of the late Harry Kroto’s selections for Desert Island Discs. Another is that I had occasion to sort out my CD collection recently and I realised in doing so that I had more recordings of this Symphony than any other. And the third is that I heard a discussion on Radio 3 recently in which a record company executive noted that while sales of opera performances on DVD were very healthy, it was very difficult to sell DVDs of symphonic concerts. I am not particularly surprised by that but I have to say that I love the visual as well as the auditory experience of a classical concert. A large group of talented people coming together to make music is a great thing to watch, and it also helps understand the music a bit too. I’d much rather go to a live concert (even a mediocre one) than listen to a CD (even a very good one), but failing that I’d definitely go for a DVD. All of this provides an excuse to show this film of the Vienna Philharmonic under the baton of Leonard Bernstein playing the gorgeous third moment (marked Ruhevoll) of Symphony No. 4 in G Major by Gustav Mahler. My favourite recording of this symphony is actually by Von Karajan with the Berlin Philharmonic on Deutsche Grammophon, but this is well worth watching to see the communication between Lenny and the band. And if you think Mahler is always gloomy and angst-ridden, hopefully this will make you change your mind.